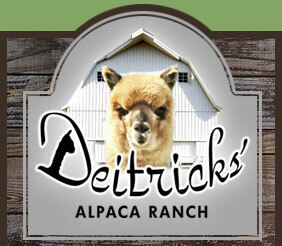 Greetings from the “ Deitricks’ Alpaca Ranch “! Please browse through our site and acquaint yourselves with these delightful creatures who have brought us full circle from “being raised on a farm“ to “coming back home to the farm” after 58 years of other pursuits of livelihood. Dwight is a retired business man, and Wanda is a retired school teacher. You know the old saying that “you can take the boy out of the farm, but you can never take the farm out of the boy” – that’s true of us. Our only regret is that we waited too long. We will never live long enough to get to do all the things we’d like to do with the alpacas, no matter how much we like working with them. We’ve been in the alpaca industry for about twelve years. Right now we have 71 alpacas after starting with a foundation herd of 7. Our “desire” is to continue to build a healthy, happy herd of “show” quality alpacas with fiber excellence and color diversity, using some of the best blood lines in the country in our breeding program. We are located 7 miles southwest of Prophetstown, IL. on a little 50 acre farm surrounded by good “corn, hay, and bean” country. We’re “learning” everyday – we’ll continue to “build up” our herd as long as we’re able, and we are “enjoying” these loving, gentle animals. Over the years we have concentrated on a selective breeding program and have had many wonderful show quality alpacas, but this October 2012 will be our firrst time stepping into the show ring and we will be debuting three of our best! We also will have some excellent alpacas for sale. In selling, we will be reasonable with pricing, making package deals, ect. to encourage more people to be interested in this growing industry. We’ll also be as helpful as we can by passing on to you anything we’ve learned through our own experience. Thanks for checking us out, and keep in touch!